I just thought I would pop in for a moment to let you know I haven't fallen off the face of the Earth, I have been resting and taking some time to feel better. I shall be back hopefully this weekend with a new post. I have missed visiting your blogs and seeing how and what you are doing. I appreciate you all very much! hope you feel much better soon!!! Stay well and recover well! 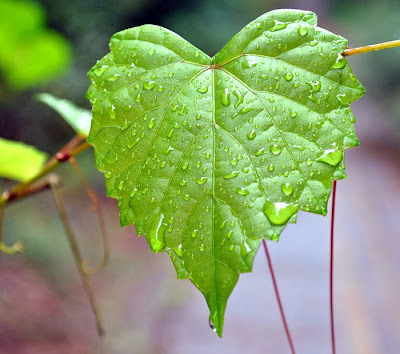 Are not heart shaped leaves beautiful?! Hugs and love.....keep well my friend. You were missed! Hi Terri..hugs..enjoy every sparkling moment of your healing opportunity..such a powerful post and image..beautiful! Wishing you many sparkles and hugs, rejuvenation and joy!! Thanks for all the beauty you share and all your uplifting talent you inspire us all with! I appreciate your bloggy friendship very much! This is a precious photo, my friend. I am sending out healing and positive thoughts........big hugs. I hope you feel better and take good care of yourself. Oh, good for you Terri. We all need to do a little more of that...resting, and taking care of ourselves. Hoping your rest has rejuvenated you and feel better. I love the positivity of your posts and the wonderful talent you share. Sending you healing hugs from the Isle of Wight. Refresh yourself, Terri, and feel well again soon. We miss you, too. I hope you are feeling better soon too.A cup of tea and some good books ? Warm hugs and cyber chicken soup to you! Take care, Terri! Looking forward to your quick recovery and return to blogland! You're missed! Sending you Reiki love and healing! Sorry you are under the weather! The image of the fresh green leaf wih water droplets looks peaceful and eloquently,'speaks wholenesss and healing',just gazing upon it's beauty. May God bless you with a speedy recovery! Thank you so much, each and every one of you! Take care of yourself. I hope you will feel much better. Come back to us as you are able.